Aww, he looks so sorry for himself and deflated. It’s part of a dog’s “job” to roll in inappropriate things. Kathryn – Shhhh, don’t encourage him! Some are worse than others! 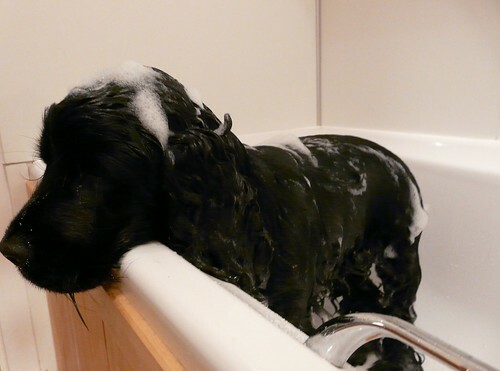 But I think spaniels in general are really good at sneaking off & rolling in something nasty. I put Ricky (now 11 years old) into a icy cold stream once, because I didn’t want whatever he rolled in to be in my car. Yucky yuck! Now I have a crate, so at least it would be confined to the crate & I wouldn’t have to put him in the stream again…. Boy did he look miserable. Didn’t connect the dots either as to why this was happening….